Here is a puzzle for your dog to solve. We say try it on your dog, for no human would be so stupid as not to get the solution in an instant. If a blind person gets a pay rise of 10% does he see any better? 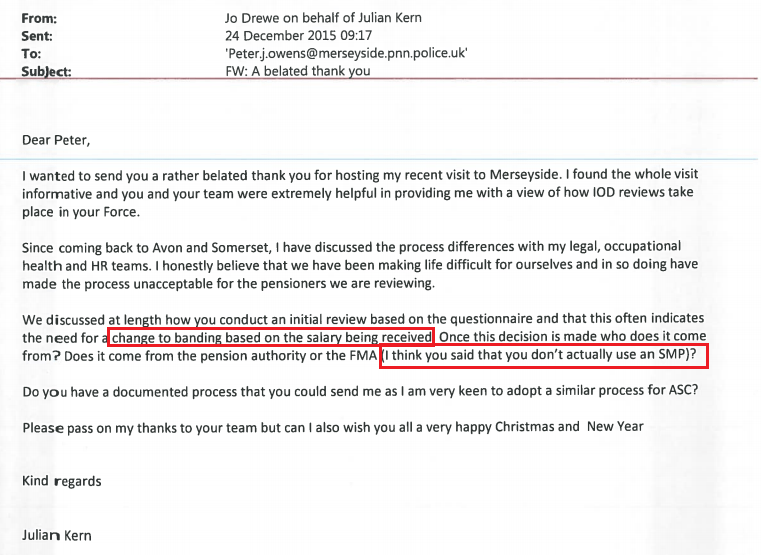 Using the same sort of logic, we conclude that the Medical Retirement Officer for Merseyside Police, Mr Peter Owens must be a particularly dumb pooch. He wants pensioners to tell him if their earnings increase by more than10%. In fact he requires them to tell him. 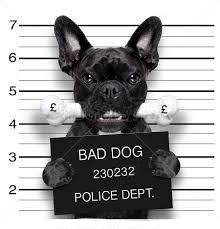 Bad boy! Get in your basket. You don’t give the orders around here. This is what Mr Peter Owens writes to disabled police officers who have just had their degree of disablement ‘reviewed’. My Aunt Agatha’s ancient poodle got it in an instant, thus proving that some dogs are more intelligent than some humans. Or that all dogs are brighter than Mr Owens. There is no connection between what a person earns and their degree of disablement. If there were, your GP would slip you a crisp tenner instead of a prescription for happy pills. Enough of the satire – we don’t want to be thought of as being cruel to dumb animals – let’s hand over to the legal experts, such as David Lock, QC. To save our constant readers the bother, IODPA has searched both the Regulations and the relevant case law and we can say with some authority and complete confidence that any salary is not, in itself, evidence of substantial alteration in degree of disablement. We have pondered why, out of the 502 disabled former officers who were reviewed by Merseyside Police in 2015, a total of only 25 had their injury pensions reduced and not one was increased. The results from Merseyside’s reviews proclaim that, with none of the 502 people they reviewed, there wasn’t a single scenario in which the degree of the pensioner’s disablement had altered by virtue of his earning capacity deteriorating. This does not sit right with us. It’s one thing staying neutral on the reasons why 25 could be reduced but it’s going beyond all realms of possibility that no single person has gotten worse. We have data from most other forces concerning recent reviews and, overall, nearly 7% resulted in an increased injury pension payment. On the basis of that statistic, Merseyside’s reviews should have produced about 35 increased injury pensions. Here is the full version of Mr Owens’ letter, which he sent to a former officer with an injury pension. 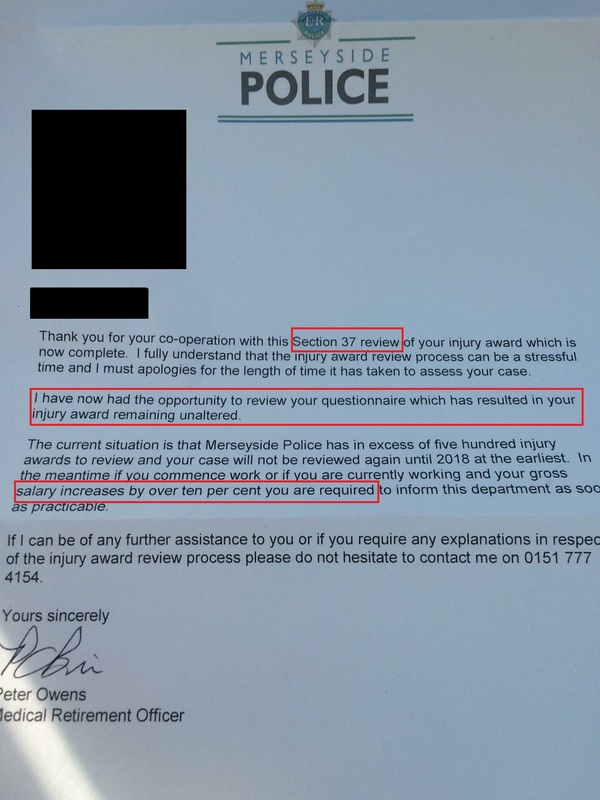 Mr Owens has invented a ‘Section 37’ – perhaps he means Regulation 37 of the Police (Injury Benefit) Regulations 2006. But reading his letter further, an invention of a new section of a new Act of Parliament seems quite apt as he does not refer to any known power in the body of police pension law. Mr Owens says he has reviewed the award himself and has found no alteration. Mr Owens does not seem to be a qualified medical authority, his title of Medical Retirement Officer and the missing Dr title, actually suggests he is a member of the HR department. Finally Mr Owens postulates that the former officer is required to inform him of any greater than 10% increase in any gross salary. Note the important absence of Mr Owen saying that he should be notified ‘as soon as practicable’ about any decrease in salary. Let’s look at another important recent case, the Laws Appeal 2010. An improvement to a medical condition which leads the former officer to be able to perform work that was previously barred to him could amount to alteration. Not a 10% rise in salary. Earnings are irrelevant to the Regulations. What happens if the former officer was medically retired and had been underpaid for his capacity to work for a decade but then received a salary increase as his company was taken over by a competitor, would he have to report to Mr Owens? Mr Owen’s letter is a travesty of the Regulations. Mr Owens has got it so wrong it is barely worth wasting time with demolishing his nonsensical letter. But it shows clearly why Merseyside reduced 25 and not increased anyone. They only reduced those who declared a salary – irrelevant whether this salary was in relation to their capacity to earn as stated in the previous final decision. And the rest were left alone but told officiously and with no power or jurisdiction to do so, to report any greater than 10% increase in gross salary. This perversion of the Regulations wasn’t missed by the Chief Finance Officer of Avon & Somerset, Mr Julian Kern, when he visited Merseyside (descended ghoul like, a shadow drawn to the smell of blood) on the 17th November 2015 to see how that force ploughed through 502 reviews when he has only managed 9, at a cost to the ratepayer of at least £63,000. Does he smell a way to dispense with the blundering, indecisive, expensive Doc Johnson? Is he hoping to rescue his plans for mass reviews by having a clerk shuffle the papers and make the decisions? Given this revelation, all of the 25 reduced by Merseyside now have grounds to appeal. Merseyside has made a massive error in law and should now be held accountable. Merseyside NARPO and Federation offices need to discover the 25 people reduced and fight their cause. They fail to realise that a ‘no change’ decision is itself a decision. A review isn’t a one way street. How could Merseyside defend this Peter Owens if the person reviewed by him disagreed with his proclaimation that no salary means no change? Will Mr Owens appear as the defendant at a PMAB? The statutory scheme requires an assessment by a medical authority, one selected by the police pension authority , as to whether there has been an alteration in the degree of disablement first – using case history and a combination of medical records and face to face interview if appropriate. A further quantum decision on the present degree of disablement is only permissible if the police authority, acting by the SMP, have first decided that there is a substantial alteration in the former officer’s degree of disablement. In both instances it is always a medical authority that answers. This is a travesty of justice. Complete contempt towards the service of injured officers. They should be totally ashamed of themselves. Every day something new turns up which leaves me astounded as to the lengths forces will goto reduce iod pensions. ABSOLUTELY DISGRACEFUL. !! This man KERN is an absolute plant pot and has proven how little he understands the regulations and his contempt for case law, even NAMF could have invented this! Kern’s email dated 24th December 2015 states that he is “very keen to adopt a similar process for ASC” – WTF??? I hope the new CC has deep pockets, because Kern is about to bankrupt the force!! So let me get this straight – say I am totally disabled and unable to work. I go to see an old friend of mine that I grew up with, who has done very well for himself and is now a multi-millionaire with a thriving company. He takes pity on me and offers me a place on his board as a non-executive director, which means I’m now on an annual salary of 5 times that of what I was earning previously, and in return I only have to turn up for a board meeting every six months (but he says, only if I feel up to it). So am I now cured? – No. Has my ability to earn money suddenly increased (earning capacity)? – No. But, on this basis these clowns will no doubt reduce my award? – See you in court! An extreme but eloquently put example Ted of how earnings ≠ earning capacity. Thank you. The above needs no comment!